What would you do if you lived in a world where your every move was scrutinized by your own personal artificial intelligence - a world where everything is regulated, from power usage to relationships - a world where everything you thought you knew turned out to be a lie? Welcome to Tisaia - the last hub of modern civilization in a world left scorched by the nuclear fires of the Biomass Wars. Surrounded by a fortress of steel walls and protected by a fierce and loyal Council of Royal Knights, Tisaia seems relatively safe to the average State worker and citizen. 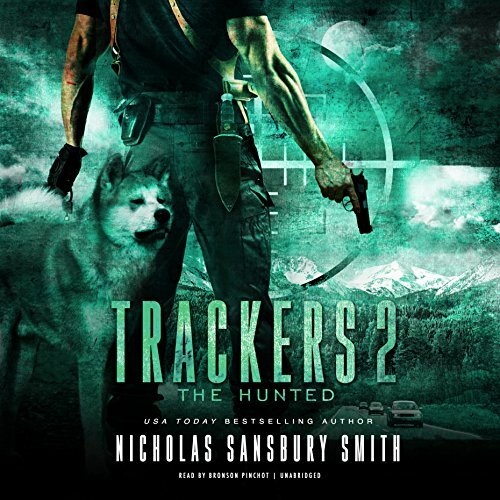 The deadly hunt continues in book two of the best-selling Trackers saga. Five days ago North Korea detonated three nuclear warheads over the United States, triggering an electromagnetic pulse that crippled the country. A second attack destroyed the nerve center of America in a nuclear blast that flattened the nation's capitol. As the government falls apart in the aftermath, the survivors must decide how far they will go to save the ones they love. Police Chief Marcus Colton has struggled to maintain order in the isolated mountain town of Estes Park, Colorado, with the help of expert tracker Raven Spears and stranded pilot Major Nathan Sardetti. Together, they fought the evil terrorizing the town - but new threats are rising, and old rivalries are coming to a head. Charlize Montgomery, newly promoted to Secretary of Defense, is caught between loyalty to her country and love for her son, Ty. When the marines sent to find Ty in Colorado discover a scene of unspeakable carnage, the straightforward rescue mission turns into a deadly chase as the hunters become the hunted. The Hunted is Trackers Book 2 and just 5 days after the EMP attack humans are again primitive as they fight to survive. The result is carnage, literally survival of the fittest. I have listened to the final two novels in the series and I recommend them, but am not reviewing them. In the first book and first review I noted some of the voices by the reader were distracting. In fairness I am happy to write no such distractions in book two!! The story improved as characters settled in. I really enjoyed it. I am a big NSS- fan, and thoroughly enjoyed the ongoing story of Estes park, and my new favorite character Raven! powerful characters, and a story I want to continue hearing. is that not the true proof of an excellent author? This story is horrifying as well as terrifying. Not because of monsters but because it comes across as REAL, especially if you have been keeping an eye to world news! Mr. Smith has a way of making not only his main characters so well rounded that they could potentially be a friend, a neighbor, or a relative but because he writes these characters with faults, demons, and the capacity of goodness, kindness and love. But I think that it is Mr. Pinchot who is the defining key in making these characters real to me. His ability to interject the right emotions into the character takes him from being a narrator to a Master Storyteller! Where does The Hunted rank among all the audiobooks you’ve listened to so far? thats hard to say, but Raven personality seemed more personable in this book. nope, just a good listen/read. Nicholas hit it out of the park, great book!!!! This book was a great read, I can't wait for next one. 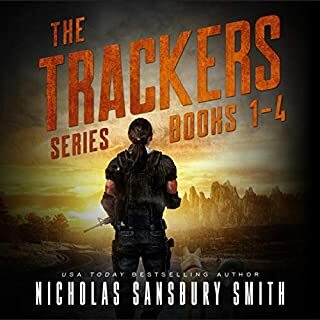 Especially after getting to meet the author and his lovely fiancee in Estes Park , I can really visualize the Trackers story in Estes Park, come on book 3!!!! Don't miss out on this awesome series. Fresh from having saved the town and their families from serial killers in the small town of Estes Park, Raven and Nathan find themselves on the move to find Nathan’s handicapped nephew, Ty. Still plagued by radiation, thugs on the road and other dangers, both head off to Ty’s last known location. While the US is recovering from the devastating EMP attack, others are ready to take advantage of the chaos. Ty’s mother, the new Secretary of Defense is trying to find the last North Korean sub and also to save the rest of the US and her son from the newest homegrown terrorist – General Phoenix. Together, Raven and Nathan hunt down General Phoenix and set into motion a deadly and a fight to the death. Action packed, this second in the Trackers series is mesmerizing. 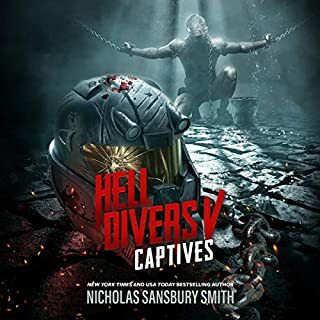 Nicholas Sansbury Smith has a gift for blending fact with fiction and creating a horrifying story. A story that will keep one up for nights because the monsters he creates are people we very well may know in real life! People who make headlines daily but who fail because there is no chaos – yet! I have had the pleasure of enjoying several of Smiths books, this series, however, is far more frightening than any of his others. He knows how to take terror and grow it, cultivating it until his readers cannot stop listening to his books – they know his horror can happen! 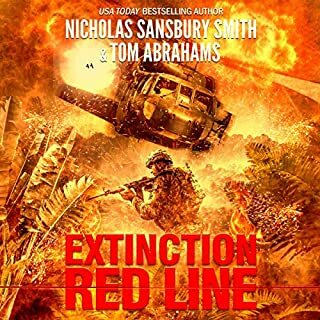 Well written with a shocking twist that will leave you gasping – I had to wait a couple of days to write this review because I was in shock and mostly angry at Smith! I won’t say anymore but like life, a writer can be so unfair! Once again Bronson Pinchot owns this book! His talent of presenting each character with a voice that one can only love or hate; he nails each one perfectly! I hate the voices of the President and General Phoenix – they are grating and “holier than thou” type voices thus gearing the audience to hate the men and appropriately so. While Raven, Nathan and Chief Colton are solid husky voices that demonstrates strength and stability – you cannot help but feel a strong connection to them and grow to love them. I'll be purchasing the next installment in the series so that's recommendation enough I suppose. 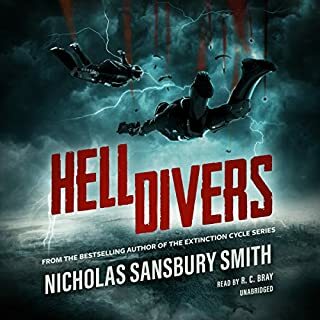 I'm finding myself loving this series just as much as the author's Hell Divers series. Nicholas Sansbury Smith creates such a realistic environments and relatable characters. NSS is definitely one of those authors that I will blindly buy books from without reading the description, because I already know I'm gonna like it! In this book, Raven and Estes Park face even bigger threats. 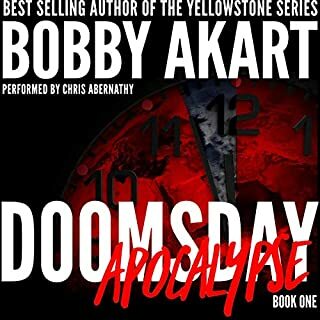 As if surviving an EMP wasn't bad enough, Estes Park is now having to deal with raiders while Raven and Maj. Sardetti try to find and rescue the Major's nephew from a group of racist skinheads. Can't wait to start book 3 first thing in the morning. 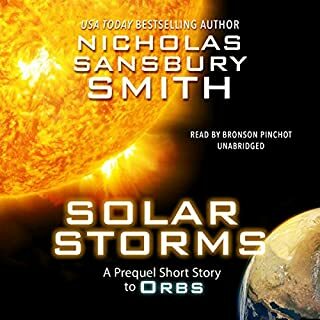 Another great story by Nicholas Sansbury Smith, and a great narration by Bronson Pinchot ! A worthy sequel, action packed with great characters the reader can engage with!! Scary to think this could actually happen!! American Society Begins to Crumble. Would you consider the audio edition of The Hunted to be better than the print version? I did not read this story. I preferred to listen to the narrator who gives an excellent performance. What other book might you compare The Hunted to, and why? The Hunted continues the story from Book One in the series "Trackers." The overlap of the two books is seamless as the main story continues with new subplots and adventures to maintain your interest in the story . The narrator Bronson Pinchot gives an outstanding performance, his vocal/tonal changes for different characters was entertaining and very effective. The author cleverly uses different characters and story-lines to highlight the effects of the North Korean EMP attack on all levels of American society. Some of the results are not pretty as the social structure begins to degrade. I did a lot of listening at night and during trips in my car. The book was finished in a couple of days. I can't wait for the next installment and have already placed an order for the yet to be published third book in the series.